Have you ever had big ideas and futuristic concepts that you think would change the future? More than 5000 participants from 89 countries had the opportunity to pit their creative ideas and innovative improvements against one another, for a chance to see their conceptual designs realised at Airbus' Fly Your Ideas 2017, the global student challenge! Three Malaysian teams successfully entered the second round, namely Team Putra Space from University Putra Malaysia focusing on Passenger Experience, with Team See Lab and Team Bunga Raya from University of Kuala Lumpur competing in the Manufacturing category. They will explore these themes alongside 47 other teams from 37 nations around the world. From January to May 2017, these 50 teams will start developing their ideas and share updates on their progress, with only five teams to be chosen for the third round and one step closer to the top prize of €30,000 and €15,000 for second place. 50 teams. 50 Ideas. €45,000. A chance to see their ideas come to life. 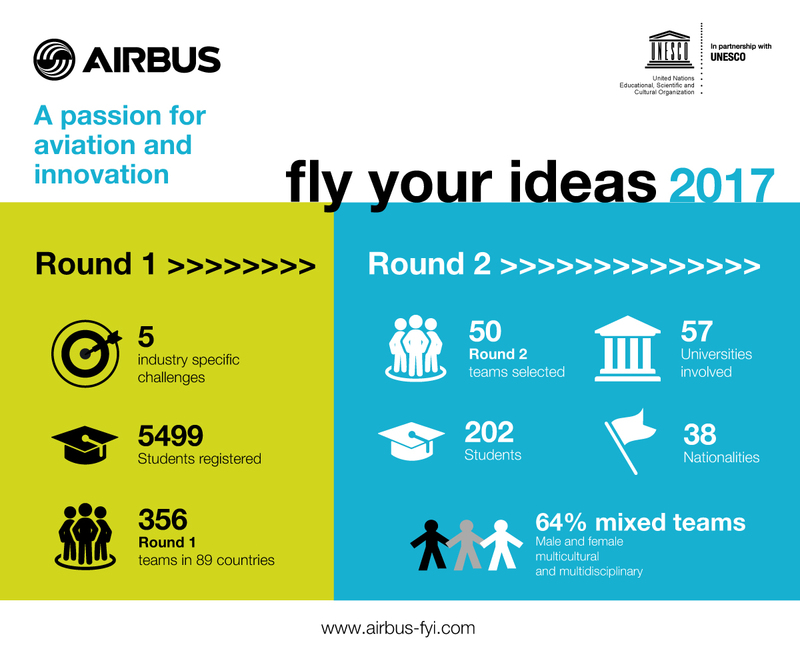 A record 5,499 students from around the world registered to participate in the fifth edition of Airbus’ Fly Your Ideas, the global student challenge organised in partnership with UNESCO. A group of 60 Airbus experts and innovators assessed the ideas submitted by 356 teams from 89 countries. The rigorous evaluation process took place at four different Airbus locations in France, Germany, Spain and the UK, with 50 student teams selected to reach Round Two of the competition, starting in January 2017. The competition is led by teams registered in the Asia-Pacific region. The 50 teams comprise 202 students representing 38 different nationalities. With 52% of teams mixing male and female students, two thirds of all teams are diverse in some way, for example with members coming from different countries or studying different subjects. This reflects Airbus’ commitment to diversity which it sees as an essential driver for innovation and success. Innovative ideas from the 50 chosen teams include robotic luggage trolleys, passenger seats which can be boarded outside the aircraft, new solutions for energy harvesting and virtual reality applications. Each of the teams has 100 days to refine and develop their ideas. The top five teams to make it through to Round Three will spend a week at the “ProtoSpace” based at the Airbus HQ in Toulouse to prototype, test and visualise their ideas using state-of-the art equipment with personalised guidance from Airbus. The winning team will receive a €30,000 prize, the runner up team €15,000, at a live prize giving event in May 2017. From January 2017, the 50 teams will start developing their ideas and share updates on their progress with photos, sketches and stories posted on www.airbus-fyi.com.